Patriotism has always been one of the most sensitive topics to be discussed and debated on, no matter the country in question. India, being a secular nation with a number of regions, religions, languages, and even castes involved, it's easy to get lost within the umpteen points of view that every person has the right to hold and the biases spill out from every ideology and principle that the political parties of the country believe in. The Supreme Court's order on playing the national anthem in movie theatres before the feature film is screened was one such example that had brought forth divided opinions from large sections of people in our country. While there were some who argued that standing for mere 52 seconds of the national anthem won't ruin the movie-watching experience of people in any way, and in fact, showed love for the motherland, there were others who believed that the national anthem should be played on solemn occasions that called for it, rather than play it before movies where it doesn't always receive the respect and reverence it is deserved. On Tuesday, diluting the order that was passed on November 30, 2016, the Supreme Court is making it optional to play the national anthem at movie screens across the country. According to a report by Economic Times, a three-judge bench led by CJI Dipak Misra took this decision at the instance of the central government, which said it was examining the issue of respecting the national anthem in depth and would come up with new rules within six months. National Anthem: Supreme Court modifies earlier order, directs playing of National Anthem in Cinema halls is not mandatory. Notes Centre's submission about Committee which has been constituted to decide on all aspects relating to National Anthem. Petition disposed of. Movie-goers, however, will have to stand up with respect for the national anthem if a movie theatre chooses to play it before the screening of the feature film, except for certain exempted class of people, such as the handicapped, the ill, etc. While we all stay put for the new orders to be officially put forth by the court, Twitter didn't hold back from expressing their views on the new proposed order, and in their expected fashion, decided to have fun with it. 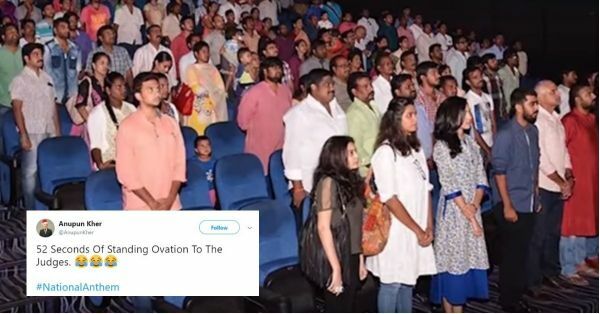 #NationalAnthem not mandatory in Cinema halls from now onwards. Supreme Court accepts Govt request. That’s a very good news. Cinema halls is not the best place to play National Anthem because Anthem should be respected all the time. Not sure that is happening in Theatres. Hope it stops in theatres henceforth, cinema hall isn't a place to exhibit Nationalism ! !